Nice large mugs measure 4 1/4" tall and have nice big handles. 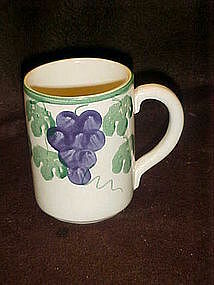 Made by Crock shop of California in their grapes and vines pattern. I now have 4 available and both are in excellent condition. Price is for each mug. Crock shop is no longer in business.